Dilemma: was it wrong to catch killer with DNA? Have the deeds to your home been destroyed? The DNA Day sales are over, and Ancestry's DNA test has gone back up to its normal price (£79 plus £20 shipping in the UK). But, before the sale ended, I bought an extra kit so that I could give it away as a sort of reverse birthday present. This offer excludes members who live in France, as DNA testing is illegal there. Tip: you don't need to be an Ancestry subscriber to test with them, or to view your results, or to contact the genetic cousins you are matched with. However you cannot view the trees of other members unless they invite you. When I mentioned to Findmypast that the 14th Birthday of LostCousins was just around the corner they immediately wanted to know how they could help us celebrate - and I suggested that a discount on subscriptions would be a great way to reward members. All of these subscriptions include virtually unlimited access to all of Findmypast's historical records and newspapers from around the world, including the 1939 Register, their fast-growing Catholic records collection, military records, migration records, and parish registers for many counties in England and most of Wales (plus transcribed records for many other counties). They also have an amazing collection of Irish records, and an impressive collection of records from Australia and New Zealand. Note: these offers are for new subscribers only (though I suspect that lapsed subscribers can also benefit); if you have an existing subscription neither Findmypast's offer nor my offer below will apply. But bear in mind that if you have an existing 12 month subscription you'll qualify for Findmypast's Loyalty Discount for renewals (currently 15%). LostCousins can only benefit if you use a link that I've provided. So I'm once again offering a free subscription to members who go out of their way to take up Findmypast's offer using my links and ensure that your purchase is tracked - this means that the total savings you make can be as much as £28. But please read the terms and conditions below so that nobody misses out - if you qualify you will get a subscription which last for 12 months or 1 month, depending which Findmypast subscription you purchased. To claim your LostCousins subscription (which will run from the date of purchase of your Findmypast subscription, unless you already have a LostCousins subscription, in which case it will be extended), please forward to me the email receipt that you receive from Findmypast. Screenshots aren't sufficient - I need to know the precise time of your purchase (so write it down, in case the emailed receipt doesn't arrive). You can use any of the LostCousins email addresses, including the one I wrote from when telling you about this newsletter. Terms & conditions: your free LostCousins subscription will be funded by the commission that Findmypast pay us; if we don't receive any commission on your purchase then unfortunately you won't qualify, so it's up to you to make sure that doesn't happen. For example, if you use an adblocker the link may not work; if you have disabled tracking in your browser the link will appear to work, but Findmypast will ignore it, so won't pay us any commission (this is the most common problem - if you’re not sure ask for my advice before making your purchase, afterwards is too late!). Commission isn't paid on renewals, and may not be paid on upgrades. Whilst it's reassuring to know that this newsletter is one of the most eagerly-anticipated publications in the world of family history, it’s important to remember that the only reason it exists is to support and promote the LostCousins project - to connect family historians around the world who share the same ancestors. There are now over 1.6 million individuals in the England & Wales 1881 census who have been entered by one or more LostCousins members - that's more than 6% of all the people in that census (for Scotland 1881 the equivalent figure is just over 3%). Whilst the main focus will continue to be on matching entries and identifying cousins, it's now time to introduce the second phase of the project - one that will further cement the link between the current generations and our forebears. Most of you will be familiar with the Lives of the First World War project, a collaboration between the Imperial War Museum and Findmypast which aims to remember as many as possible of more than 8 million men and women who played their part in the Great War. That project is coming to an end early next year - it will close to new submissions on 18th March 2019. The aim of phase 2 of the LostCousins project is somewhat similar - to create a link between ALL the people who were recorded in the 1881 Censuses and their living relatives. We've been doing this during the first phase of the project, of course, however our primary focus hasn't been on the relatives in the census but on the cousins that we can find. In phase 2 both will be equally important - and I like to think that by making connections between the late 19th century and the early 21st century we'll be making history, one relative at a time! What this means is that EVERY relative you enter from the LostCousins censuses will make a difference - EITHER your entry will match with that of another member who also has a connection to the relative, OR it will be a completely new entry, helping to get the project closer to our eventual goal. Note: you won't at see any significant changes on the LostCousins site, at least at first - we'll be using the same technology, and your My Ancestors and My Cousins pages will continue to be the two most important pages on the site. Nor am I planning to increase the cost of subscriptions - it will still be £10 for a single account and £12.50 for a joint subscription covering two linked accounts, the same as it has always been! If you’re a regular reader of this newsletter you'll know that I aim to be the first with the news that really matters. Of course, because there usually only 2 or 3 issues per month, I can't be first to report every single press release - instead I aim to provide a more in-depth look at key issues, even when they're not obviously related to family history. For example, just over 5 years ago I told you about technology that had been developed at Cambridge University which claimed to make highly accurate predictions about Facebook users simply by analysing their 'likes' - you can read the original article here. My original article was intended as a warning about the dangers of using Facebook, not because I foresaw how the technology would be used, but because I knew that family historians had more to lose than most - in our enthusiasm to help others it’s all too easy for us to post information that can be misused by fraudsters or other miscreants. According to a blog post earlier this month the public profiles of almost all 2 billion Facebook users are likely to have been stolen - and whilst this data isn’t as sensitive as the personal data of 87 million users (which was allegedly stolen, or rather "improperly shared" by Cambridge Analytica), it’s still somewhat disconcerting to know that our information can be so easily misappropriated. Note: in the past week Martin Lewis, the financial guru who founded MoneySavingExpert.com has announced that he is suing Facebook because of the continued promotion on the site of adverts which make use of his name and likeness to promote scams - you can read all about it on his blog here. You may remember that in January 2017 I wrote about another scam I encountered on Facebook - unfortunately, as long as there are people in this world who are gullible or greedy there will be confidence tricksters seeking to separate them from their cash, but for this to happen at a website operated by one of the world's most valuable companies is unforgiveable. If you followed the link in the previous article to my April 2013 article about Facebook you may have noticed that in the very next article I asked "what other memorabilia and police evidence bear DNA samples that might potentially allow a modern reanalysis of an old case…?" DNA expert Debbie Kennett, writing on Twitter, agrees that the action taken by police is not against the Terms of Service of GEDmatch, but argues that it isn't something that GEDmatch users would be expecting to happen when they submitted their own data - she suggests that the police acted unethically. Indeed, it could be argued that what seems to have happened in this case is equivalent to what is alleged to happened in the Cambridge Analytica case - in each instance the data on the platform was mined in order to produce results that none of the users of the platform could reasonably have anticipated (unless, perhaps, they were readers of this newsletter!). At the same time there are some clear differences - in one case the action was taken for the public good, in order to bring a serial killer to justice, and in the other it was taken for private profit and (it has been alleged) in order to subvert democracy. Nevertheless, questions of ethics are always difficult to answer and even when you do think you have an answer it can be undermined by a change in the frame of reference. The 'trolley problem' is a wonderful example of an ethical dilemma - see this Wikipedia article for a discussion of the issues. But whatever you think about the ethics of the case, it isn't a reason not to test your DNA. Nobody who tests their DNA has to upload the results to the GEDmatch website, and even if you do, you don't have to attach a GEDCOM (indeed, I deleted my own GEDCOM file some time ago, because I was concerned that any GEDmatch user could view it, whether they were related to me or not). It's also worth noting that GEDmatch isn’t just about finding more cousins, or providing more detailed analysis on matches you've made at other sites - it offers all sorts of added features such as "Predict eye color", "Are your parents related" and "Archaic DNA matches", where your DNA is compared against that of ancient humans whose remains have been discovered. Personally I think it is wonderful that a suspect is now in jail thanks to the ingenuity of a 'cold case' team, and I hope it helps to bring closure for victims and their families. 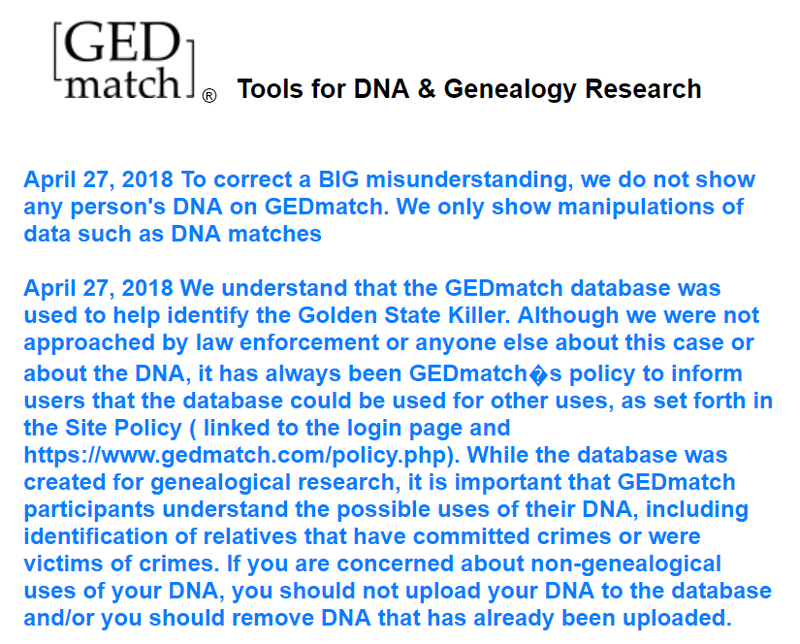 As I understand it the DNA Doe Project also uses GEDmatch to help solve cases where a body cannot be identified, but I'm not sure that anyone has objected to GEDmatch being used in that way - so far, at least! However it doesn't give us any rights when the organisation holding our data decides that it is no longer needed. Public bodies are expected to take into account the historical value of documents, but lots of things that I regard of historical value probably wouldn't be thought of that way by someone else (not even my wife!). Just look at the range of records that are already online for family historians - as diverse as passenger lists, dog licences and tax records. Who can say what will or won't be useful in the future? Perhaps Tesco's Clubcard records will tell more about how people really lived in the 21st century than anything else? Most of us have problems remembering what happened when we were younger, in particular when it happened, and in which order things happened - so even the smallest clues (a theatre ticket, a hospital stay) can help us reconstruct our lives. We try to do this for our ancestors - we certainly ought to be able to do it for ourselves! I appreciate there are practical problems in giving individuals a right of veto over the destruction of information that relates to them - but we should still try. Since the last newsletter was published several LostCousins members have written to their local MPs to express their concerns that with the introduction of GDPR next month it will be even more likely that unique records will be destroyed - if you want to add your support feel free to include any relevant articles from this newsletters. Earlier this month there was a flurry of correspondence in the Daily Telegraph after one of their readers wrote to complain that his mortgage provider had destroyed the 500 year-old deeds to his house - you can read about it here. Once again this incident wouldn't have been a surprise to regular readers of this newsletter, because I wrote about this topic in 2014, and mentioned it again in February of this year. Although property deeds might not be classed as 'personal information' under data protection legislation (even though they invariably include the names of individuals) this is an excellent example of somebody destroying information because it was no longer of any use to them, even though the records were clearly of historical value, at least to the owner of the property. All too often I lose touch with LostCousins members because they forget to update their My Details page when their address changes. I don’t immediately take action when this happens for the simple reason that if I did, I would have no time to do anything else - but if another member is subsequently matched with them I move heaven and earth to track them down. The last resort is to send them a letter - assuming they've provided a postal address, or have such a rare name that I can identify them in the Electoral Register - but if they're in the the UK then before drafting the letter I carry out a quick check to see whether they have moved house. It's very simple - I just put their postcode into Google, and look through the results for one at the Rightmove website. It’s an amazingly quick and easy way of checking whether a home has been sold - and you might find it useful too, especially if you're thinking of writing to a cousin you haven't spoken to for many years, or who you've found in the Electoral Register. The information at Rightmove comes from the Land Registry, in case you’re wondering, so it’s public information. Tip: the 2002-14 Electoral Registers for the UK can be searched at Findmypast;bear in mind that after 2002 it was possible to opt out of the published register, and about 40% of us did. But if you find someone in 2002 you can always make use of the tip above to check whether they've moved in the intervening years. The forenames in my family tree are pretty conventional, though my great-grandmother was a sister of Mercy (Ellen Mercy, to be precise), and of course there are the occasional surnames that have been repurposed, though almost always as a middle name, rather than as a first name. But many names we now regard as conventional were once new: according to an article in the May 2018 issue of The Oldie by Johnny Grimond the forename Clive was a tribute to Robert Clive of India, whilst Percy was the family name of the dukes of Northumberland (to whom Percy Bysshe Shelley was distantly related). Cecil, Howard, and Nevill were also the surnames of aristocratic families. Florence Nightingale was named after the city where she was born; her sister Frances Parthenope was not as fortunate in her birthplace! Some children might be thought as unfortunate in their parentage - the four children of the musician Frank Zappa were named Moon Unit, Ahmet Emuukha Rodan, Diva Muffin, and more conventionally Ian Donald Calvin Euclid (though he is known as Dweezil). Similarly the many unconventional forenames of the children of politician Jacob Rees-Mogg include Alphege, Wentworth, Dunstan, Anselm, Wulfric, Pius, Sixtus and Boniface. So the news that the new prince - who is 5th in line of succession to the British throne - has been named Louis Arthur Charles is slightly reassuring. As genealogists we often resort to researching the FAN club (Friends, Associates, Neighbours) of our ancestors when direct vital records for them can’t be found. We also research important historical connections of our family members to hang “flesh” on their bones. However, most family historians would not divert time to researching a non-family member’s history. But my indulgence in researching another individual and his family whose life briefly intersected my grandfather’s led me on a diversion lasting a decade which resulted in the recovery of a lost historic WWI film in which my Grandfather Oswald Schuette appears, a film of which no residual memory remained in either family after less than two generations. Upon retiring I began helping an uncle gather WWI correspondence of my Grandfather Oswald Schuette, who reported from Berlin for a Chicago paper. I noticed an article about Wilbur H. Durborough who praised Schuette for enabling him to capture real war pictures that the paper had sponsored. No DVD was available. While continuing my Schuette byline hunt, I searched for this film. The Durborough family knew nothing about any film or his travel to Europe. I soon found parts of the film in our National Archives but much was missing. I decided to write an article about Durborough and his film as a warm up for the Schuette war correspondence book. As I began writing, I learned from Kevin Brownlow that someone had just published an article about Durborough and his film beginning: “In the nitrate vaults of the Library of Congress in Culpeper, Virginia, repose thirty-two cans of film entitled ‘Durborough War Footage’. They are an example of the way in which an important and fascinating collection of film can arrive at a film archive and then be more or less ignored ….” Think “Raiders of the Lost Ark”! I contacted the author, we shared research, resulting in my being asked to join this recently retired curator of film, Library of Congress, and a Dutch film scholar in writing a book on American WWI cinematographers. Our book research synergy determined the film’s detailed content and located the missing film scenes for this film enabling the Library of Congress to reconstruct it in 2015. You can see a frame by frame capture of a war casualty caught on film from the film’s “Bloni sniper scene” if you follow this link. Early war cinematographers were a collection of fearless adventurers, felons, & fast talkers….. It was, of course, the marriage between Genista Philpotts and Kenneth Broom - because Genista is the Latin name for the plant we normally call Broom. Only 16 people called Genista married in England & Wales between 1837-2005, so it is quite a coincidence that one of them married a Broom, hardly one of the most common surnames in Britain (less than one person in a thousand was called Broom in 2002, according to the Electoral Register). Or is it really coincidence - were they, perhaps, attracted to each other because of their names? Or did they seek each other out? Anyway, I digress. The second part of the puzzle was to name the Royal house that was in some way connected to the marriage - and, of course, the answer was Plantagenet, derived from planta genista. According to the book Geoffrey V, Count of Anjou, was given this name because he liked to wear a sprig of broom in his cap - and his son, nicknamed Curtmantle on account of the knee-length cloaks he favoured, became Henry II of England in 1154 on the death of Stephen. Plantagenets were to rule England until 1485 when Richard III (nicknamed Crookback) died at the Battle of Bosworth, ending the Wars of the Roses. There are hundreds of entries in the book, and as I dipped into it I couldn't help learning snippets of history that had previously passed me by (perhaps not surprising considering that I failed History O-level). It's not an essential purchase, but with used copies available for as little as 1p (excluding shipping), and new copies of this gold-embossed hardback for a little more, it's well worth considering for a bit of harmless fun. And like me, you might learn something! Last July I reviewed Herding Hemingway's Cats: Understanding How Our Genes Work by Kat Arney, a fascinating tale of how our understanding of genetics has progressed over the past 60-odd years since the structure of DNA was discovered. That book took the form of interviews with key people in the field, and as I said in my review I didn't understand everything..
You might think that Kat Arney's follow-up, How to Code a Human, would be a comparatively easy read given the lavish colour illustrations - but it has actually taken me over 6 months to finish, admittedly with some well-earned breaks. The problem is, I wanted to understand everything, and I eventually came to the realisation that even if I did understand each section as I read it, there was simply too much information for me to internalise it all! Those of you who are younger than me may well find it easier. Fortunately we don't need to understand how everything works in order to use DNA to supplement conventional family history research - we just need to know how DNA is inherited. It's when we want to understand why humans differ from each other, and how our genes can affect our health, that it's necessary to fiddle around 'under the bonnet', to continue the analogy from the previous review. But whilst some forms of a few diseases can be attributed to differences in specific genes, the reality is that we're a long way from determining precisely what causes most afflictions, and even further from coming up with a 'fix'. So whilst there is a lot of information in this book, it's only a small part of the story - after all, it's only 15 years since the first human genome was sequenced, which is not a long time to unravel a process that evolved over billions of years. 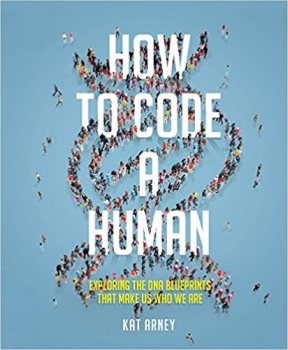 Reading How to Code a Human underlined for me both how much we know and how little we know: we are the most complex creatures ever to have walked the Earth, and almost certainly the only ones capable of understanding our origins, yet we have fewer genes than an apple or a grain of wheat! This is the first year we've forced some of our rhubarb - under a deep plastic composting bin - and what an improvement! The stems are more tender, and require less sugar to be added - delicious, especially when cooked with ginger and served with natural yoghurt (low-fat, of course). Although we usually have fresh fruit for breakfast I'm very happy to have stewed rhubarb in season.